The two chefs at Kitchen 713 on Canal Street, Ross Coleman and James Haywood, both have upscale backgrounds: Coleman worked at Hotel ZaZa and staged under Wiley Dufresne at New York’s now-shuttered molecular temple WD-50, while Haywood previously found success both in restaurant kitchens and as a consultant. 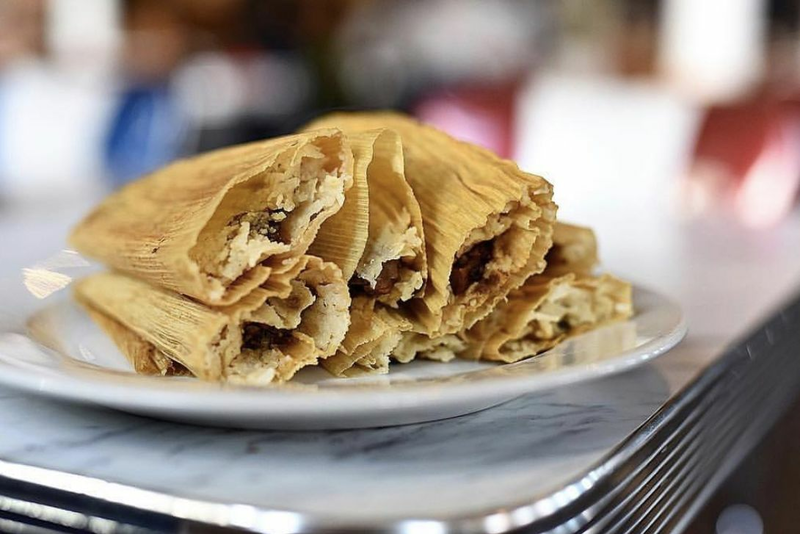 But you wouldn’t necessarily know that upon first walking into their modest Second Ward eatery, which has mostly warehouses for neighbors—that is, until you taste their cooking, which will make you feel the love in a way only a soul food restaurant can. Among their attributes, the chefs know that the fat and flour of the American South isn’t the world’s only gravy. 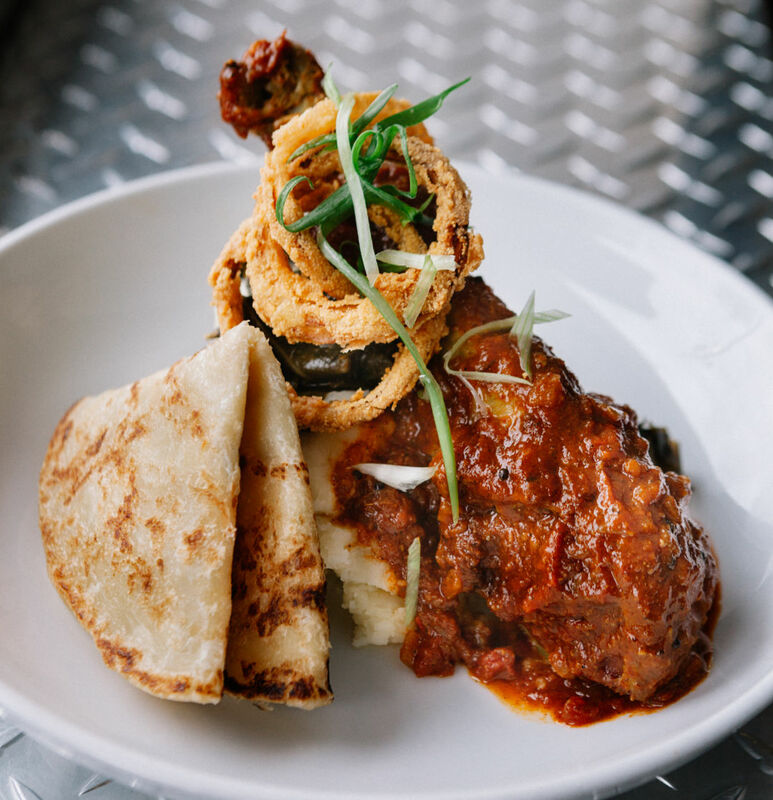 At dinner, a fall-apart-tender turkey leg is served not in a bland brown sauce but beneath thick, peppery vindaloo with a carefully folded round of chewy, fresh-from-the-pan-hot roti. And this is no straightforward Indian dish: The spicy meat is covered in fried onion strings and sits atop a pile of perfectly prepared collard greens. It’s like something soul food queen Sylvia Woods and Indian cuisine empress Madhur Jaffrey would cook up after a tipsy evening together. In fact, most of the cuisine here is grounded in soul food, but not anchored to it. 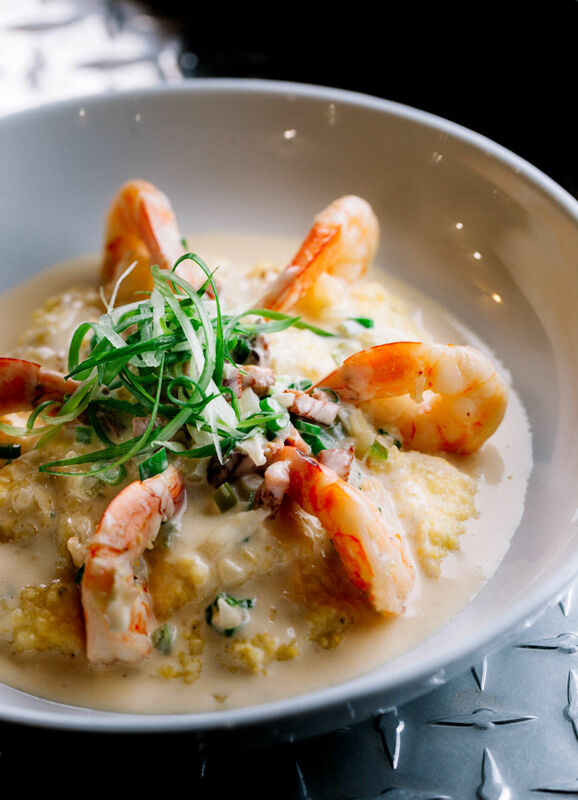 The shrimp and grits, a more by-the-book recipe than other offerings, has earned fans thanks to its ultra-fresh seafood and intensely cheddar-flavored, coarsely ground grits. Chicken-and-sausage gumbo comes with a silken roux and a slap of heat. At lunchtime, oxtails, sticky with collagen, arrive griddled between thick slices of white bread for a grilled cheese that may necessitate a nap, especially with the full side of salty, eminently crisp battered fries. Even dishes that are less than impeccable are interesting. Who ever thought of serving a red curry pork “Bolognese” over flat rice noodles? These guys. They crank the heat up to 11, which doesn’t benefit the dish, but are either smart or crazy enough to tone it down with Parmesan shavings and peanuts. It’s a brazenly weird plate, the kind of thing that might play a starring role at a restaurant’s staff meal, but rarely beyond it. Perhaps the pair’s greatest asset is giving their guests credit. They trust that diners will not only order turkey necks, but enjoy them in the form of pulled meat stuffed into lettuce wraps with pickled veggies and sweet Vietnamese-style nuoc cham. And they know when to keep it simple. The menu’s single dessert, candied sweet potato bread pudding, is soft inside, with a griddled-crisp exterior. Squiggles of caramel sauce and a scoop of local vanilla ice cream makes it a dish your mother would have served if she’d been at the head of her culinary school class. The two chefs have forged their own path in the unprepossessing space for more than a year. Haywood told me in December that while the location had allowed the pair to get started with low overhead, they’re now eyeing new spaces in Montrose and the Heights. Once relocated, the restaurant will be expanded to include a full bar and a more extensive menu. It’s a sure thing that 713 will gain much in the move, but it will lose something too. 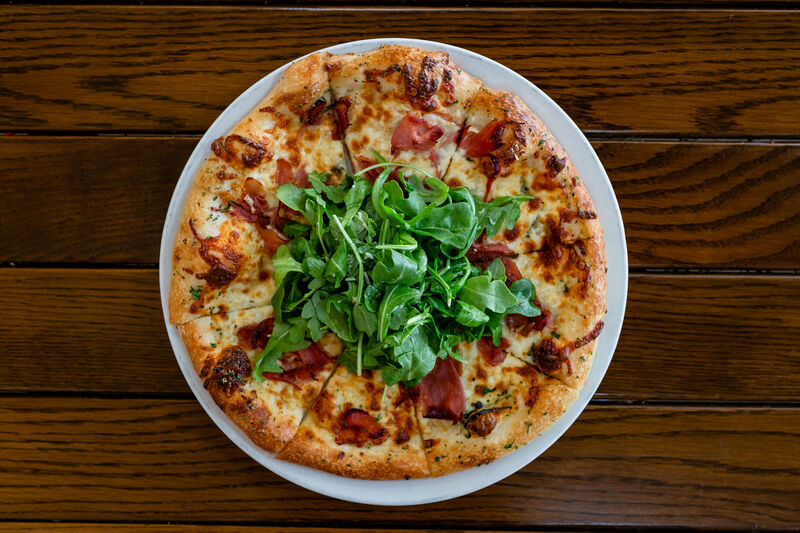 There’s a feeling of uncovering a secret while you order chef-driven food at its unassuming counter. Bones or sports is on the TV, and diners serve themselves sweet tea and lemonade and pick up their own utensils. The dining room features a mysterious tiled nook that looks suspiciously like a shower without a showerhead. 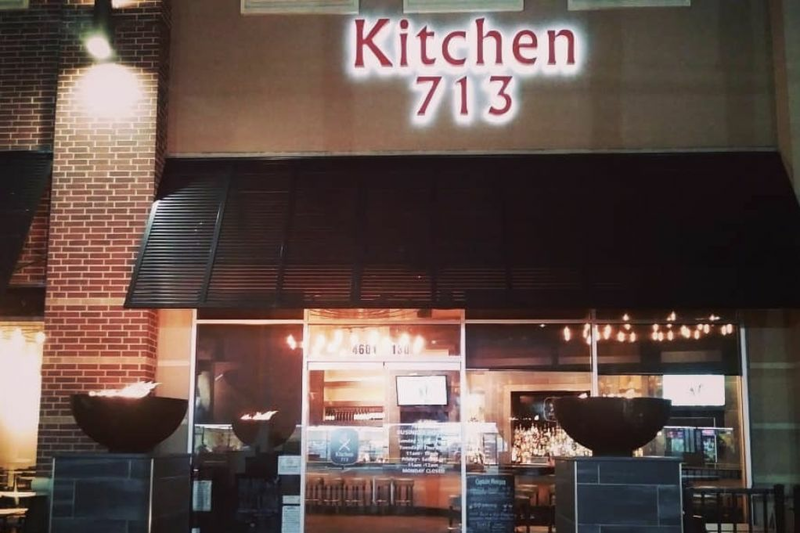 It’s no surprise that Coleman and Haywood—and Kitchen 713—are moving up in the world; few deserve it more. Make plans now to seek out their new location when it materializes, but be sure to visit soon for a taste of raw inspiration. Diners in Tokyo know exactly what to expect of an izakaya. It’s a place for biiru and sake that likely also serves snacks along the lines of kushiyaki (grilled skewers) and their fried counterpart, kushiage. 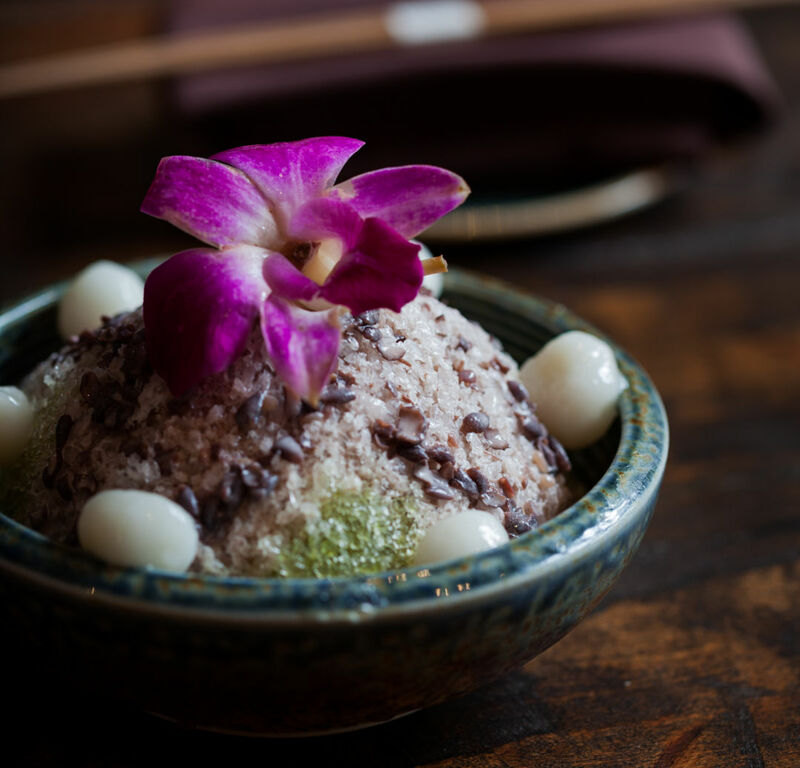 However, at Houston’s Izakaya in Midtown—the newest concept from the Azuma Group, which owns not only Kata Robata but also Soma Sushi and a smattering of Azuma sushi restaurants across the city—you’d be forgiven for expecting more. The presence of chefs Manabu Horiuchi and Jean-Philippe Gaston, both Kata Robata alums, suggests that the cuisine might transcend ordinary izakaya fare. 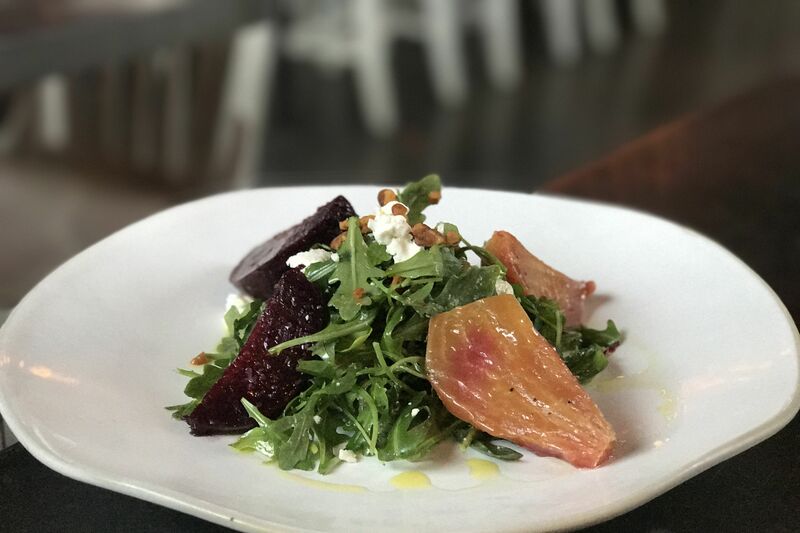 Initially, the goals for the restaurant, which opened last summer in the old Farrago space on Gray, did appear loftier. The décor, for one, suggests that the place is meant to be a destination. 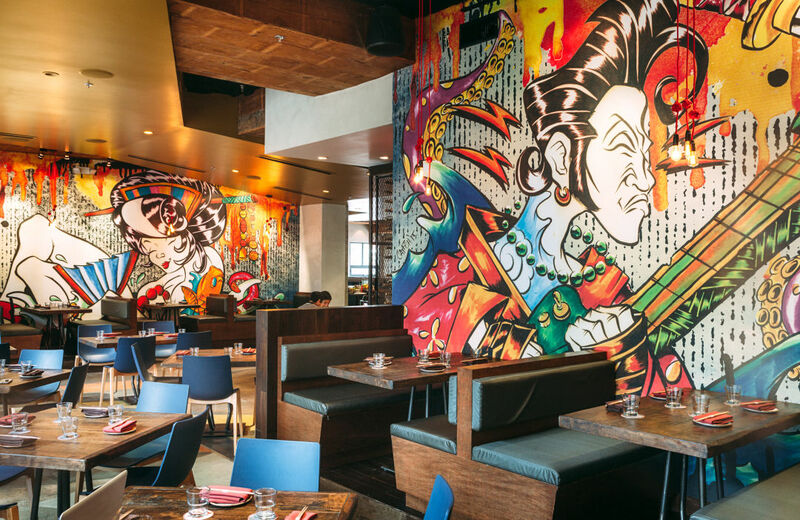 The warehouse-chic room is every bit as hip as Midtown scenesters could want, with wood tables and tattoo-inspired, Technicolor murals by artist Catfish Perez on the walls of the larger back dining room. During my visits, however, that room was nearly empty. Each time, most customers were at the bar, sampling from the clever drink list designed by San Francisco cocktail consultant Claire Sprouse, a former Houstonian. The concoctions seamlessly fuse Asian flavors with Western spirits: The Far Eastern Daiquiri, for example, pairs rum with lemongrass and fino sherry, while the Izakaya Whisk(e)y Cocktail incorporates peach and sesame into a house whiskey blend. The menu sounds exciting, and certain sections deliver. The chefs excel in the world of seafood. Horiuchi trained at Tsuji Culinary Institute in Osaka and apprenticed at a Michelin-starred sushi restaurant in Tokyo. At Kata Robata, he shared his Nipponese craft with Gaston, already a seafood expert, with experience at Reef and Cove, the latter of which Gaston helmed to great acclaim before it closed in 2014. Not surprisingly, both chefs’ refined skills appear mostly in the form of raw fish dishes. 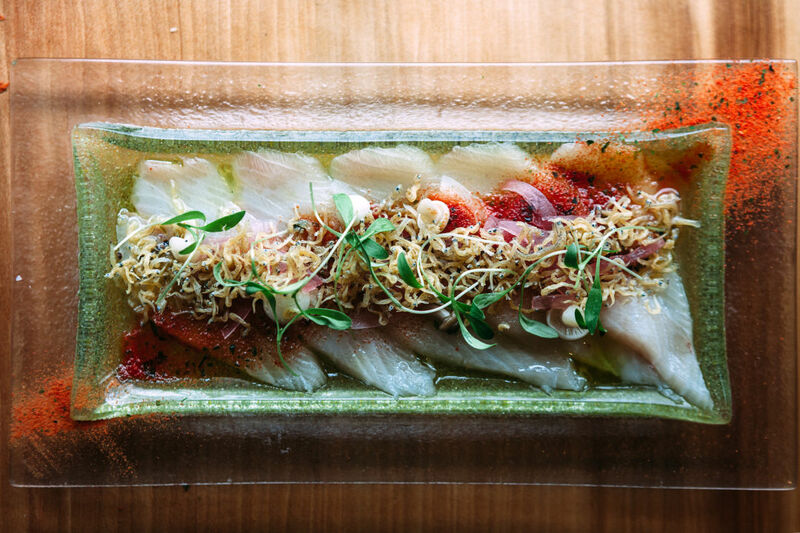 Among those delights is a hamachi crudo literally tarted up with tomato powder and a puckery pool of ponzu. Tiny shimeji mushrooms add texture, while micro cilantro shines bursts of light throughout the whole dish. The masterstroke is the addition of something that most Western mouths will initially interpret as fried onions. But look in their eyes: That crunch really belongs to hundreds of nearly microscopic fried sardines. This upending of expectations shows wit to spare and scores with uncommon flavor combinations. The lunch-exclusive Bowls of Greatness include a yakiniku-don, which combines Wagyu beef, onions, mushrooms and carrots over rice. A 62-degree egg turns to creamy sauce with a single stroke of the fork. It’s an elevated, indulgent take on Japanese home cooking, and one of the areas—along with its crudos—in which Izakaya truly shines. 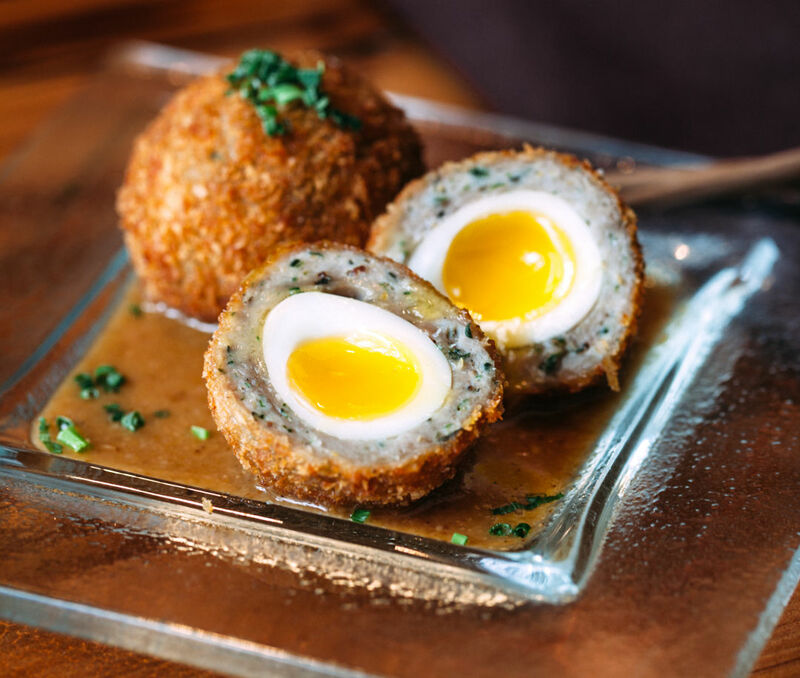 Similarly, the chefs’ take on a Scotch egg, using Texas quail and carved tableside for maximum runny-egg impact, is served in a sesame vinaigrette that still has me salivating. And while their house fries are even, crisp beauties on their own, a light dressing of gingery sauce, nori and bonito flakes makes them hard to put down. If only the menu were filled with such clever crudos and Japanese-American combos. But unfortunately, much of what’s on offer is both heavy and heavy-handed. Take, as an example, Izakaya’s chicken-fried steak. I was particularly excited to see what the chefs would do with the everyday American menu item. The dish’s Asian influence appears as kimchi-braised collard greens that sparkle with spice and fermented zing, but the greasy CFS on top could be served at any dive bar. The tofu gravy on top tastes like, well, gravy—minus the flavor. It doesn’t just fail to live up to expectations of the chefs’ craft. It simply isn’t satisfying pub grub. Similarly, bacon-wrapped mochi, featured among a selection of yakitori-style skewers, are rice cakes served undercooked and stiff, wrapped in flabby bacon, then drenched in mayonnaise. And at lunch, dishes that sound Japanese-tinged on paper—venison sausage served in a pretzel bun with yuzu kosho slaw, and mini antelope-meatball subs with kimchi marinara—just taste like a syrupy teriyaki hot dog and a deep-fried meatball Parm. In general, and perhaps owing to its location in the party-heart of Midtown, Izakaya’s fare leans more toward the category of “drunk food” than “Japanese food.” Given the obvious ambition of the menu, this is disappointing. Here’s hoping Horiuchi and Gaston realize that drinks are good, and fat is good, but they’re at their best when flavor comes first. They must trust their customers’ taste, just as Coleman and Haywood do.